In the heat of summers long ago, when Serius, the Dog Star appeared just before dawn, the men of ancient Pelion, clad in their sheepskins, would ascend the forested mountain to the icy cave of Chiron. Here, this half-man, half-horse, the wisest of all the Centaurs and a gifted teacher, revealed the secrets of myriad medicinal plants that carpeted Pelions slopes. The men plucked fragrant herbs and flowers from the rich earth to take back to their villages. They collected fresh water from streams that gushed from the mountaintop. So renowned was Chirons knowledge that many heroes came here to be mentored, including Jason, Achilles and Hercules, as well as future god of medicine, Asclepius, who mastered the art of healing with the Centaurs arsenal of poultices and ointments. Even the gods of Olympus loved verdant Pelion above other mountains in Greece. It was their summer playground. 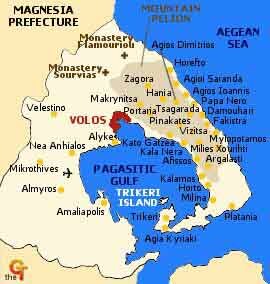 Map of Pelion  A peninsula rising above the Aegean Sea in the Province of Thessaly, mountainous Pelion shields the Pagasitic Gulf and the port city of Volos. Nearly 20 traditional villages dot its well-watered and densely green slopes. I am hoping to encounter this Pelion of the ancients on a visit to Thessalys perpetually green mountain, shaped like a giant hook rising above the Aegean and the Pagasitic Gulf. Less known to foreign tourists but a favorite of Greeks, its string of centuries-old communities boasts distinctive accommodations, enduring traditions, and a wide selection of outdoor activities. My husband and I arrive on a sweltering July afternoon after a long drive from Athens, planning to attend a folkdance conference in Portariá, but also to immerse ourselves in the unique charm of the region, with visits to a handful of its most-renowned villages. Ahead of us stretches Volos, built on the ruins of ancient Iolkos, today the largest city in Pelion and a regional transportation hub. It was here, I remind myself, that Jason boarded the Argo with his intrepid Argonauts in quest of the Golden Fleece. Today the port is swarming with cargo ships, fishing skiffs, and ferries packed with tourists headed to Skiathos, Skopelos and islands beyond. Fishermen have spread their nets out to dry, but the long seaside promenade is virtually deserted in the afternoon heat, the locals lingering over their mid-day meal in noisy tavernas and bars. The city functioned as an administrative center for the entire mountain during the 400-year Ottoman occupation, but little of that era remains, for Volos won its independence in 1881, growing and modernizing rapidly in the 19th and 20th centuries. Lets continue on to Portariá and visit Volos on a cooler day, suggests my husband. Portariás rooftops peek though luxuriant stands of aged chestnut, oak and sycamore trees. 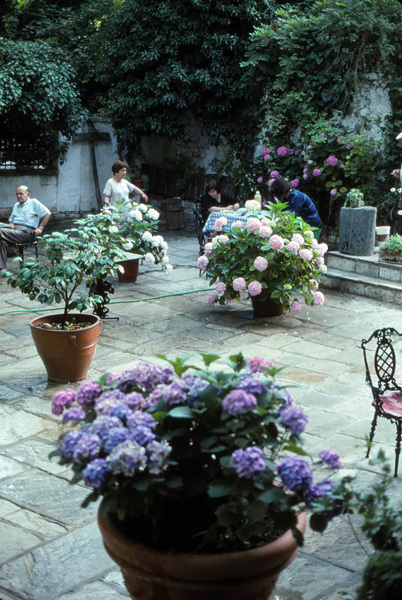 Giant pots of hydrangeas decorate the gardens of the Xenía Hotel. Its a perfect morning. Yesterdays fog has vanished and the landscape is sharply etched under a bright sun. Less than three kilometers away, Makrynítsa is a historic community known as the Balcony of Pelion, boasting views even more dramatic than Portariás. Cobbled lanes are lined with stately multi-storied homes, many with three levels and false windows on the street side but only one level on the entry side, an ingenious design devised long ago to take advantage of the steep terrain and provide safety and privacy during the Turkish rule. We cross the shady central plateía (square) packed with tables of locals immersed in animated conversations. An aged plane tree leans over the crowd at a dramatic angle, as if ready to fall down at any minute. Near the square Markrynítsas stylish folk museum dates back to 1840. It was donated to the town by the Topali family in 1932, with recent renovations completed in the early 90s. Impressive, says my husband, gazing at its fortified construction complete with battlements and barred windows. Inside is a sizable collection of traditional costumes, old photographs, and equipment for distilling rakí. Several rooms furnished with choice antiques reveal how the villagers lived long ago. We meander at leisure. Next to the tiny church of St. John the Baptist, a marble fountain with three lion-head spigots spurts immortal mountain water into a pool. I dip my fingers in the icy pool. Its source must be the stream near Chirons cave, I am convinced. 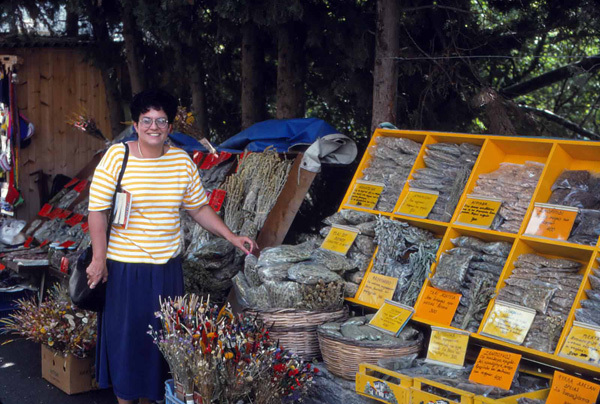 Near the fountain, a village cooperative displays jars of glyká koutalioú, jarred spoon sweets made from local chestnuts, apples, apricots, quince and figs. Another artisanal shop specializes in medicinal plants that grow wild on Pelions slopes. I glance at some of the offerings: valerian, nightshade, nettle, mandrake, St. Johns wort, even hemlock. Pelion is famous for more than 1,000 therapeutic and culinary herbs, I remind my husband as we peruse the lineup, wondering how many ancient remedies have been forgotten over time. Pelion is famous for more than 1,000 therapeutic and culinary herbs that have been used since antiquity. Tantalizing aromas waft from Pantheon, a taverna overlooking the bay where several patrons are enjoying bowls of fassouláda, a hearty broad bean soup flecked with tangy Pelion peppers. It comes steaming to our table with half a loaf of rustic bread sprinkled with sesame seeds. Amazing, says my husband as he mops up the last of his soup. Craving a little dessert, we wander into Theóphilos Café, famed for delectable pastries filled with firíkia, tiny aromatic apples that come from Zagorá, a town known as the apple orchard of Pelion. On the wall a faded fresco by Theóphilos, Greeces great folk artist, depicts the Battle at Cold Mountain, a scene from the revolutionary war. Born in Lesbos, he left his island at a young age for Smyrna on the Turkish coast, later migrating to Pelion where he lived happily but impoverished for some 30 years. His naïf murals and paintings can be found throughout the mountain, most notably at the Kontos mansion in the town of Anakasiá. Greeces best known folk artist, Theóphilos, lived and worked in Pelions villages for 30 years. 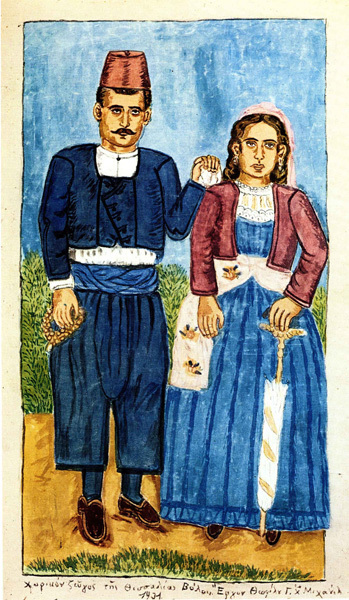 Here, a couple from Volos is portrayed in the traditional attire of the region. A friendly local seated at the next table overhears our conversation and decides to practice his English. So you like Makrynítsa? he asks, turning his chair to face us. Very much, I smile. Bravo, he continues. I am Stamatis. I would like to tell you about an important custom here. In Makrynítsa we will soon be celebrating Maïdes, our May days. But we observe them in July. They are part of an ancient tradition from the time of Dionysius and Adonis. You know, he clarifies, waving his arms in the air, the awakening of the earth each spring. Not only has he gained our attention but also that of two other tables of tourists. The ritual is about a man who has been killed because he made improper advances on a young lady. He is buried with a few flowers and branches, Stamatis continues. Later, his male friends dance around his grave and, suddenly, the buried man comes back to life, all covered with flowers, just like our earth here in Pelion. The rebirth of nature is celebrated in many cultures throughout the world, but here in fertile Pelion it obviously takes on greater meaning. Efharistó, we thank Stamatis. He lapses into Greek, encouraging us to visit the top of the mountain. Ach! Eínai magikó méros (its a magical place), he sighs. 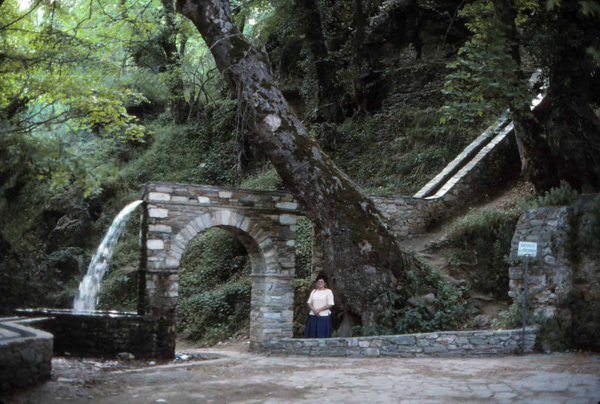 A short hike from Portariá, Mánas is the source of a spring that rises deep inside Mount Pelion. Back in Portariá, I notice several conference attendees strolling around the village. Where should we hike? we ask the lady at the hotel desk. Take my favorite trail, she suggests. Its a beautiful ten-minute walk to the waterfall of Káravos. From there you are not far from its source, Mánas. Last autumns leaves crackle underfoot as we set out on a well-worn kalderími (cobbled footpath), passing ivy-covered rocks and roadside runnels brimming with water. The variety of landscapes in Pelion is astonishing. We cross a small field blanketed in heather to a dense forest where little light penetrates. Straight ahead of us a gully shelters a sizable stream that is almost totally obscured by fallen trees. Minutes later we reach Káravos, the famous waterfall. We continue alongside a ravine spanned by several wooden bridges until we arrive at Mánas. Here a stone arch has been built to channel source water to the stream below. There is a small cafeníon with breathtaking views of Portariá and a few tables and chairs set out for weary hikers. Legend claims that the stream travels hundreds of miles through the bowels of the earth from some mysterious, faraway land. I have no doubt that old Chiron knew exactly where Mánas originated, I suggest to my husband. The night sky is ablaze with stars. We stroll through Xenías flower gardens as costumed dancers from many parts of Greece perform on wooden stages. I take special note of a group of eight women in pleated satin dresses and lace aprons. They are from Tríkeri, a community at the southern tip of Pelion. Unlike the farmers and craftsmen of mountain villages, the people of Tríkeri are seafarers and their dances resemble those of the Greek islands. On another stage, a group from Lamía in Thessaly is performing the karagoúna, a slow and stately dance that is also being sung by the dancers. Minutes later an ensemble from Thrace dazzles onlookers with an uninhibited couple dance, syngathistós, evoking the Dionysian revelry of ancient times. The performances continue for two hours, to be followed by spontaneous music in Portariás central square accompanied by endless rounds of tsípouro, Pelions own version of firewater. Another perfect morning, I exult as we start out bright and early toward Pelions northern villages. At Hánia, the highest settlement on the mountain, one can continue to Agriólefkes, a popular ski facility. A side road leads us to the windswept summit of Stavrós Pourianós, peaking at 5280 feet and equipped with radar. Fantastic! says my husband, overcome by a view of the entire Thessalian plain stretching all the way up to Mount Olympus in the north. The vista reminds me of the myth of the gigantomachía (the war waged by the giants against the gods), when with total hubris the giants stacked Mount Pelion on top of Mount Ossa attempting to wreak havoc on Olympus. Somewhere up here Chirons cave must be hidden, I shout into the wind. We continue north through beech and pine forests with a thick undergrowth of ferns. Several backpackers are making their way alongside the road, their metal walking sticks click-clacking against the asphalt. 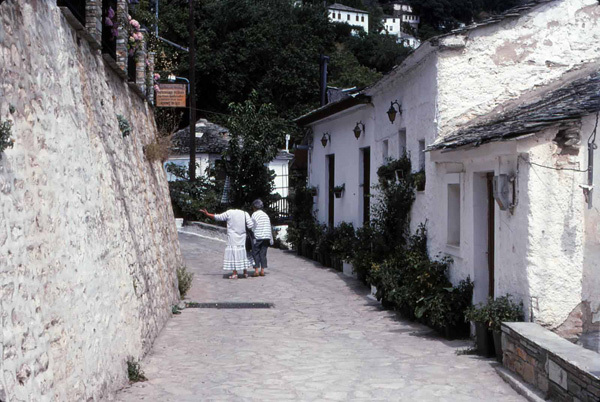 Yiá sas, I wave at them as we pass, heading in the direction of Zagorá, the largest of all the villages of Pelion. The terrain grows wilder, with rugged chasms and numerous streams that gush from a series of ledges. Behind us a trio of mountain bikers are eager to pass, and we pull aside, taking time to enjoy the scenery. Minutes later the landscape changes again. Here Pelions well-watered eastern slopes are covered with endless orchards: walnuts, apples, pears, peaches, and chestnuts. Beneath the trees tasty mushrooms and wild strawberries flourish, often appearing twice yearly. The fertile earth and abundant water turned Zagorá into one of richest agricultural centers in the Balkans. Silk and tanning industries augmented fruit cultivation and some of its village scions accumulated great wealth and became benefactors, building churches and schools still in use today. The town spreads into four distinct districts, all built around Agios Georgios, a large central square. We head to a massive plane tree in the middle. There must be a hidden stream nearby, says my husband as gurgling sounds overtake our conversation. So soothing, I sigh, ready to relax over a meal. We check out the neighborhoods. The houses here seem sturdier than in Makrynítsa, with extra heavy slate roofs and carved wooden doors and lintels. Just off the square is Zagorás library, renowned for more than 15,000 rare books and manuscripts. The towns 18th century school is reputedly the oldest in all of Pelion, named after the great Greek hero Rígas Feraíos who was once a pupil here. Today the school doubles as a museum with an interesting display on silk production. Its a bit early for lunch, so we wander into a hole-in-the-wall eatery advertising omelets made with field greens and mushrooms, served with crusty bread and wild strawberry jam. This is the best omelet I have ever had, I declare as I take my last bite. The owner takes notice of our empty plates. You like my food! he beams. Xaíromai (Im glad)! Leaving, we spot a sign pointing to the Drakopoulou Mansion, a womens cooperative specializing in spoon sweets based on generations-old village recipes. Wow, Smuckers could learn a thing or two here, chuckles my husband, dumbstruck by an epic display of enormous jars of fruit. 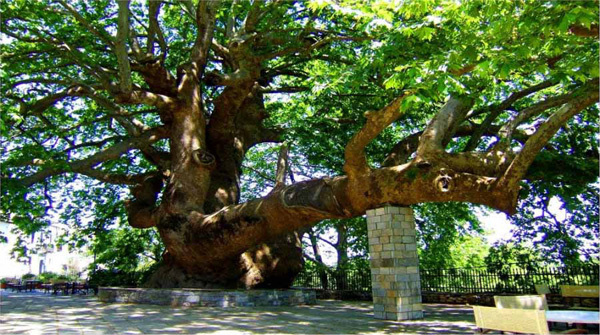 Tsagaráda, a picturesque mountain village on Pelions eastern slopes, is famed for its ancient plane trees. A mammoth specimen commandeers the square of Agía Paraskeví, one of its limbs propped up by a column of cement blocks. Another of Pelions jewels is Tsagaráda. Originally built near the sea, it was relocated higher up the mountain near a deep gorge to safeguard against pirate attacks during the Ottoman Era. Todays village is connected by four squares with beautiful churches and schools, its residential areas partially obscured by woodlands. We stop above the town sign to admire the view below. This is my idea of an enchanted forest, says my husband. A wide kalderími descends to a gully spanned by a high, arched bridge covered with ivy. Under the bridge a stream rushes, one of hundreds that drain Pelions slopes, creating the rich, moist conditions where trees seem to grow forever. If only this bridge could talk, I murmur, thinking about all the history that surely took place here. We park near the square of Agía Paraskeví and head to see its famous plane tree. More than 1,000 years old, this giant practically covers the entire plateía, with one huge, horizontal branch supported by a column of cement blocks. Upon closer inspection I see that most of the trunk is submerged several feet below the pavement. Stairs lead down to its base, 46 feet in circumference! Another ancient specimen located in Agión Taxiarchón Square is a few hundred years older, though less bulky. These trees must be the oldest living things in all of Europe! I overhear an astonished British tourist exclaim in a moment of epiphany. 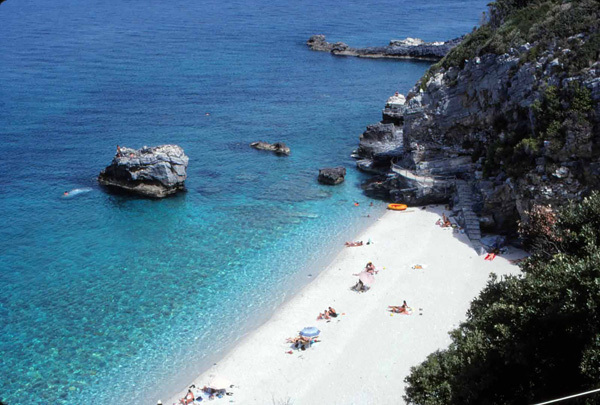 Milopótamos is one of Pelions most beautiful beaches, famed for crystalline turquoise waters in a secluded setting. The turquoise Aegean is just minutes away from Tsagaráda. Here one has three choices: secluded Milopótamos, bifurcated by a rock arch and covered in smooth pebbles, the smaller Limanáki, or Fakístra, where a secret Greek school was hidden in a cave away from prying Turkish eyes. The crystalline sea is shallow and warm here and the beaches rank among the most beautiful in all of Greece. We park our car on a small ledge and descend on foot to Milopótamos. Dozens of tourists are frolicking in the waves and squealing children are collecting pebbles in plastic buckets. A luxury sailboat moored in the distance is making a day visit from a nearby island. Could it belong to someone rich and famous? asks my husband. We walk barefoot on wet sand and pebbles, until the waves reach our knees. Half soaked, we retreat toward the rocks and spread out towels for a quick nap. 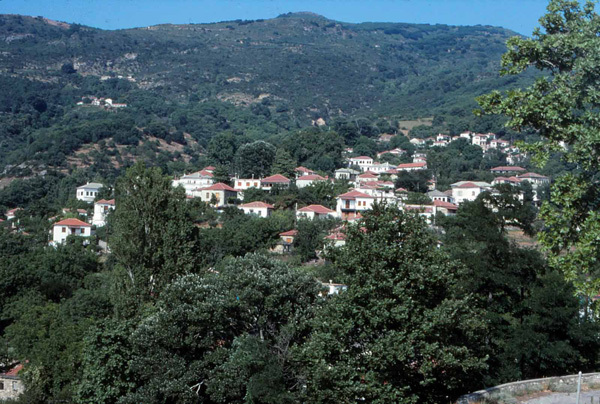 To the south, amid thick apple and olive groves, Miliés is an important town in central Pelion. Here Anthimos Gazis, a local scholar and hero, first raised the flag of revolution in 1821, leveraging the towns political and cultural status. In 1903 a small gauge railroad built by Italian engineer Evaristo de Chirico, the father of the famous surrealist painter, linked Miliés to Volos, turning the town into a vital commercial center. We stop by its 1740 church, Panmegistón Taxiarchón, unlike any other in the world. You would never guess this is a church, says my husband, staring at its unadorned, windowless exterior. An attendant explains in English: This church was built to confuse the Turks. It looks like a large house, but come inside. An anteroom is adorned with a magnificent fresco of the Zodiac. Its entire central space is covered with colorful bible scenes, including the Scales of Justice and the Entry to Paradise. But the acoustics are the highpoint. Cupolas in each corner shield four upside down jars, with others hidden in five wells under the floor, for a total of 48. The jars enable sound to bounce around, generating an eerie effect. These sounds can only be heard inside, the attendant clarifies. The Turks never knew what was happening here. Ill never forget this church, I smile, enchanted by the acoustics and a whimsical depiction of the River of Hell. We continue exploring Miliés, marveling at its well-organized history museum and a town library famous for a collection of 3,300 old print volumes. To our disappointment, the popular local train ride that snaked through wooded gorges to Ano Lehonia is no longer in operation. Makári (bless the thought), we are hoping to restore service soon, says the knowledgeable lady in the library. It would help to bring in tourists, she smiles. Katalavénete (you understand)! She recommends a corner restaurant nearby known for traditional specialties. Time for a blow-out meal, says my husband. The waiter leads us to a table in the front, suggesting we try their spanakópita made with hand-rolled phyllo to be followed by spetzofaï, Pelions signature dish, a rustic stew of locally-made lamb sausage and Pelion peppers in a rich tomato sauce. We dive in. The sausages are zesty and complex, destined to linger in our food memories forevermore. Vizítsa rivals Makrynítsa with its immaculate streets and traditional arhóntika --multi-level houses that have been converted to upscale guesthouses. A few kilometers away, Vizítsa is a hamlet famed for its towering arhontiká(mansions) that have been converted to upmarket guesthouses. Rivaling Makrynítsa, it has a unique sense of place, with immaculate streets and well-tended gardens. A friendly local takes us through her favorite neighborhood, pointing out windows outlined with delicate decorations. Some of the grandest mansions have false balconies (koultoúkia) that project out of the upper stories. A typical arhontikó has three levels, she explains, the lowest is for storage and kitchen facilities. In the old days even animals were kept here at night, their body warmth bringing the temperature up on blustery days. The middle level held private sleeping quarters, and the upper level was public space for entertaining and dining. Of course, she adds, we prefer sleeping on the top level in summer because there is more ventilation. We climb a hill above the town for a birds eye view of the old chapel of Zoodóchos Pigí, built in 1725. To the southwest, the Pagasitic Gulf shimmers, fringed by a string of beach communities that bring in the lions share of Pelions summer tourists. We zigzag downhill to Kalá Nerá, the largest resort on the gulf, terminating at its Blue Flag beach. Famed for clean water, fine sand and abundant services, the town is crawling with tourists. From here the lineup of hotels, tavernas and beaches stretches all the way back to Volos. The city has come to life in early evening. Locals dressed in their finest are strolling up and down the broad seaside promenade. We mingle with the crowd, enjoying the evening light and sea breeze, then head to Diónysos, one of countless bars known as tsipourádika. Rather than ouzo, these establishments serve up rounds of tsípouro, a powerful grape must distillation that is nearly 50% alcohol, accompanied by a variety of mezédes (small bites) to whet ones appetite. The waiter brings out the house assortment: smoky grilled octopus, steamed mussels, skewered shrimp, tiny fried fish and Pelion olives. The mezédes are exquisite, but we limit ourselves to just a couple of shots of tsípouro. We still have to make those hairpin turns on the way to Portariá, I remind my husband. 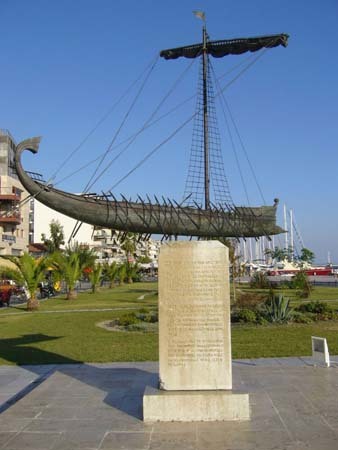 On the waterfront, a bronze sculpture depicts the mythic Argo, an oared vessel plied by Jason and his Argonauts to Colchis in quest of the Golden Fleece. The addition of a sail was the brainstorm the goddess Athena. In the cool of morning, we descend to Volos, stopping briefly to admire its magnificent Metropolitan Cathedral. As we stroll past the Athanasakeio Archaeological Museum, I spot a school group seated in the garden listening to their impassioned teacher relate stories from the Age of Homer. The narration is inspired, but for us the waterfront is the bigger draw. We head toward a bronze miniature of the Argo mounted on a marble pillar. This was the first oared vessel to ever sail the Aegean, says my husband. In the middle of the ship is a tall mast with a sail, an innovation added by Athena to help speed Jasons voyage. A well-dressed, distinguished man seated on a nearby bench notices our interest and rushes over. There are plans to build a full-size replica of the Argo, he announces, turning his head to make sure no one else has heard him, as if he had just divulged a tightly-held secret. It will sail to the Bosphorus with 50 oarsmen, 25 on each side of the ship. There will be great celebrations throughout the country. Our city is planning to build a museum to store the ship. He asks us what we have seen while in Pelion. Satisfied that we did not miss too much, he retreats to his bench, immersing himself in his newspaper. Could he be professor, or maybe even the mayor of Volos? I speculate as we head toward the car. We internalize his little secret, elated that Pelions ancient legacy is alive and well.